It was immediately obvious after watching the first replay of Blaine Irby’s gruesome knee injury but it is now official that the sophomore tight end will miss the remainder of the 2008 season. According to a press release from the university Sunday evening Blaine suffered a dislocated right knee and will undergo season ending surgery. He’ll be able to seek a medical redshirt and should have a full three years of eligibility remaining when he (hopefully) returns to the field in 2009. Longhorn sophomore starting tight end Blaine Irby sustained a dislocated right knee in Texas’ 52-10 victory over [tag]Rice[/tag] on Saturday, will undergo surgery and is out for the rest of the season, UT Head Athletic Trainer for Football Kenny Boyd confirmed on Monday. The 6-3, 235-pound Irby started all three games and had 10 catches for 95 yards and two touchdowns on the year. He led the Horns with seven catches for 62 yards and a TD in their 52-10 season-opening victory over Florida Atlantic. Irby also posted nine knockdown blocks in that game. He had a 23-yard catch at UTEP and registered two catches for 10 yards before sustaining the knee injury against Rice. He played in 11 games and registered two catches for 29 yards as a true freshman in 2007. 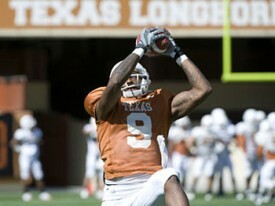 In addition to Finley leaving school early, Texas also lost sophomore [tag]Josh Marshall[/tag] during preseason drills. He sustained a left scapula injury and remains out indefinitely. Senior [tag]Peter Ullman[/tag] and sophomore [tag]Greg Smith[/tag] both have played this season and will compete for the starting tight end job. Redshirt freshman Ahmard Howard will move up the depth chart and compete for action after playing primarily on special teams this season. Fellow redshirt freshman [tag]Ian Harris[/tag], who sustained a neck sprain in August, is expected to be cleared to return to practice soon. Offensive tackle [tag]Britt Mitchell[/tag] has been playing tight end in short-yardage and goal-line situations as well. We wish Blaine good health and determination through his rehab and can’t wait to see him back catching passes again as soon as possible.